You can't apply the Warp Type command to text with Faux Bold formatting. In addition, you can't warp any bitmap type that doesn't contain outlines. The best effects are often those that result from trying several of these numbers and options before clicking the OK button. 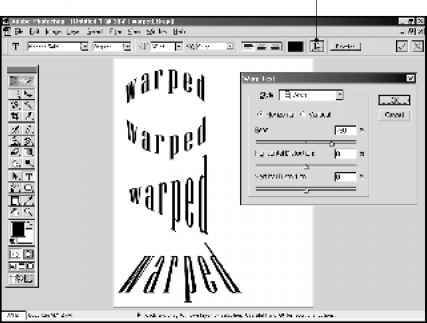 Because Photoshop shows you the results of the warp as you're setting the options, it can be quite fun to get in there and really play around with the Warp Text command. In addition, don't forget you can always use the Free Transform command (as discussed in the preceding tip) to apply additional transformations to the text after warping it.